Rohim Momin was barely 17 years old in 2013, when he got off the train in Delhi and took his first steps towards an uncertain life in the city. Accompanied by a few fellows from his village in Malda, West Bengal, Momin was to join the throngs of migrants, who come to metros in search of livelihood. He had recently lost both his parents to illness, and as the only boy among the five siblings, was expected to earn for his family and marry off his sisters. Fellow migrants put him in touch with a contractor, and he found his calling as a mason. “I was helpless. I had to quit school. I had to forget my dream to become a teacher. I had to be the breadwinner for my family. It felt like everything’s over,” remembers Momin. The fact that he would go on to represent his country in a competition considered the ‘Olympics for Skills’ in a matter of three years wouldn’t have been a piece of even his wildest imagination. And he admits he still can’t believe it. However, against all odds, Momin has made his way to the team of 28 contestants from India, gearing up to participate in the Worldskills Abu Dhabi 2017 – the 44th edition of what is dubbed as the world’s largest vocational skills competition, to be held during October 15-18. The event invites contestants from 77 countries to participate in 51 skill competitions in diverse fields like mechatronics, welding, jewellery, autobody repair, hairdressing, bakery, electrical installations, prototype modelling and mobile robotics. While Momin will compete in the bricklaying segment, other 27 Indian participants will put up a fight for medals in 26 categories. As the team came together one last time before the competition for a training session organised by National Skill Development Corporation (NSDC) in Delhi early September, lean-figured Momin, wearing a tricolour t-shirt – the same as the rest of the team – pledged to deliver his best performance. He has been training relentlessly for over a year, and is hopeful of a victory. He of course admits that it is not likely to be a cakewalk. Bricklaying is a fundamental skill used in construction work, and thus important for infrastructure development. However, in developing countries like India where quality infrastructure is the need of the hour, those who lay bricks do not have vocational training: it’s something they are supposed to learn informally, on the job. Even as the government, with its Skill India mission, attempts to highlight the importance and necessity of vocational education, in reality majority of the masons are treated like unskilled or semi-skilled labourers. Their wages, too, are often much lower than the minimum wages. When he started out, Momin could earn barely Rs 150-200 a day, after seating it out for 12 hours. “The contractor had also made arrangements for our stay in Noida, but the money was still not enough. Three of my four sisters were unmarried when I left for Delhi. I had to send some money home, plus I had to save enough for their wedding expenses,” he says. Momin’s financial situation took a turn for the better after he joined a construction company in Delhi. It was at this job that he came to know about the Worldskills India – a national competition conducted by NSDC, which also acts as a qualification and selection round for the international chapter of the Worldskills. Momin was interested, and his project manager Pavan Kumar Pandey started training him in January 2016 for the regional round of Worldskills India. Here he represented his company – ATS Infrastructure, a reputed realtor in Noida – in the bricklaying category. Pandey says, “Rohim was a very sincere boy, and his intelligence was palpable. His grasping power is really good. Us ke haathon me kala hai. [He has an artistic attitude.] I could sense that.” Momin won a silver medal in the competition in July last year and has been training for the international chapter in Abu Dhabi since then. The diagram given to the participants provides specific measurements for the model, in terms of length, breadth and shape. The participant might be asked to add elements like arches or text or shapes to be embossed on the models. Even a slightest error – difference of even 1 mm in the specifications – can slash points off the participant’s score. The scoring system is divided into subjective (weightage: 20 percent) and objective (weightage: 80 percent) criteria. While the marking in the objective criteria is based on factors such as alignment, dimension, level and detailing, for marks in the subjective criteria, attention has to be paid to the finishing of the model. Momin has been practising for the competition at Kushal Credai in Pune where Naik is one of his trainers. Kushal is a partnership project between the Pune Metro chapter of Confederation of Real Estate Developers’ Associations of India (Credai) and NSDC. Momin says, “I am using the older diagrams from the previous competitions to practise for angular models, cutting, slope and shapes like arches.” The accuracy with which he follows the measurements has been a big plus point for him. He explains, “Before I had to quit school, I was quite a smart student and hardly ever missed the first or second rank in my class. Maths was one of my most favourite subjects, and I feel like my inclination towards the subject is helping me today.” Reading and interpreting the diagram is considered the most crucial step in bricklaying. However, Momin’s good understanding of geometry makes the task less daunting for him. Most of the participants preparing for Worldskills Abu Dhabi have gone for some form of foreign training or competition, in order to have an international exposure and get used to the foreign environment. Momin, too, has come back from Denmark after his participation in a training camp. “I am perhaps the first person from my village to visit a foreign country,” he says, beaming with pride. Kavish Thakwani, a steering committee member of Kushal Credai who has been an expert partner of Momin, says that after Momin’s return from Denmark, his strategy has been revised a bit. A lot of new tools were purchased for him to practise with. “The material used in the competition is, anyway, different from what is used at the construction sites. The bricks that Rohim uses for practsing are available at only one place in the country; they come from Gujarat. Only 20 percent of the material used is indigenous, the rest is imported,” he adds. While the practice with the equipment is an important objective of training, Thakwani feels that preparing the participants psychologically for the gruelling journey is equally important. “When you are dealing with people from under-privileged backgrounds, it’s important to gain their trust. Rohim had a lot of insecurity issues. He was very defensive; had a fragile mindset. He didn’t trust anyone. We can’t pressurise him to listen to [our advice] in that phase. We had to be very patient to gain his confidence,” he says. Momin had completed his education till 10th standard, so the training was more soft skills-centric in his case. All in all, things have worked out quite well for Momin after taking up the Worldskills challenge. Two of his sisters are now married. He is still on the payroll of ATS Infrastructure as a supervisor and plans to go back to work after the competition. 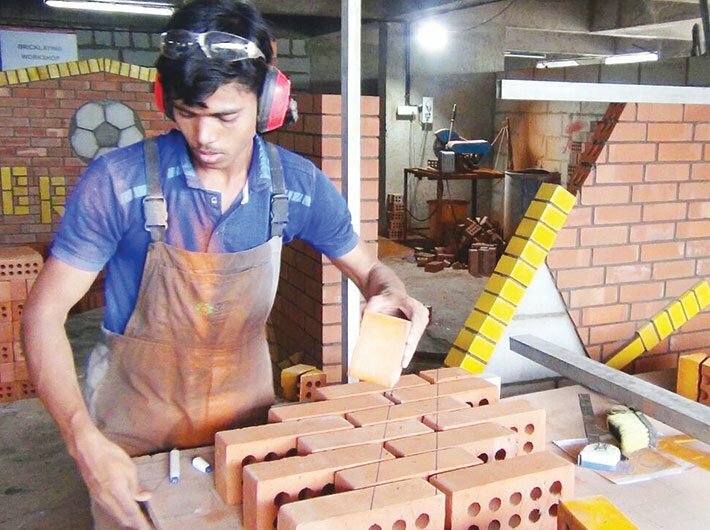 However, like most of the past participants, his stint with the competitive bricklaying will be most likely over after the international competition, which does not allow re-entry of candidates in the same category. Also, the competition is held for only those competitors, who are below the age limit of 23 years (25 years for a few categories) – leaving out a huge chunk of potential candidates. Can competitions like the Worldskills do anything to accelerate the Skill India mission? “Of course,” answers Jayant Krishna, executive director and chief operating officer of NSDC, which is a one-of-its-kind partnership between the government and the private sector. “Skilling is still not considered very aspirational in our country. People aimlessly drift in the mainstream [higher] education, even when they’re not so good with the studies. This, I think, will create a huge amount of aspirational value and instil a sense of competition,” he believes. He acknowledges that there is no strong culture of such competitions in the country yet, but participants do reap certain benefits from the venture, he feels. “The ministry of skill development is even prepared to give funds to the state governments to organise this kind of competition. Our participation in the Worldskills should eventually push for a culture of competitions for skills,” adds Krishna. He also points out that the participants in the past have seen a jump in both their designations and salaries after their return from the competition, irrespective of whether they win or don’t. “Once you have participated in the competition, you are a champion,” he adds.